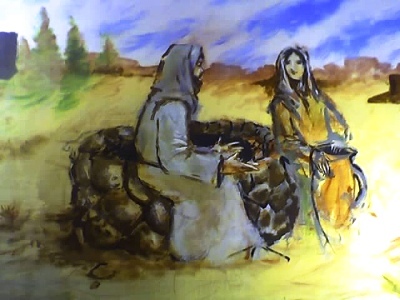 Then, of course, there is the obvious mention of time when Jesus tells the woman that the "hour is coming, and is here now, when people will worship the Father in Spirit and Truth." Can you imagine being hit with that information? Being told that the Messiah you've been waiting for your whole life was standing right next to you? And let's not forget the reference to Eternal Life. That is time without human boundaries. But the time element that really struck me today was when John tells us that Jesus "stayed there two days." Two days. That town had just two days with the Son of God. How did they spend it? What did they learn? Did they truly believe he was the Messiah ... or just a prophet? What questions did they ask? What did He tell them? Who did He eat with? How long did He preach? And how fast did those 48 hours fly by? It got me thinking about how I would spend 48 hours with Christ. But it also made me value the quiet time I spend with Him this Lenten season. No longer will I view it as an endless supply of time I can take whenever I want. No. Instead, I will view it as precious and as limited as that time the Samaritans had with our Lord. I hope you are all having a Blessed Lent. Thanks for bringing these points to light. This passage is one of my favorites. God's gift of time- how often I have wasted precious moments with Him, but also I am thankful that He continues to grace me with those moments. I am most aware of them in my hour of Eucharistic Adoration, especially when I find myself alone with Him. It's a little like being that woman at the well~He tells me everything about me. Many came to Him during those 2 days and were converted. It's amazing what God can do in a short amount of time! Good insight into that Gospel reading. I have been going to Adoration several times a week, and hope to do that after Lent as well. It is such a peaceful feeling I get after I leave; I wish I hadn't wasted so much of my time not going. I wish I could make my first priority Adoration, but I always allow life to interfere. Probably just how the Samaritans did when Jesus spent two days with them. When I sat down to read the Mass readings today, the "time" theme wasn't obvious to me, and now because of this post, :) I am able to see something new in the reading. Thank you for this. I will be more conscious of the quality time I spend with God and not rush away from Him. This post is wonderful! And to think how I would spend 48 hours with the Lord really gets my mind thinking....I would hope that I would not waste a second of it, that I would realize the gift that was given to me, that I would share this gift with others in words, deeds, thoughts. Great reflection for modern times when we seem to be rushing from one task to another never stopping to consider what this life is all about. I know I need to make more time for meditation and prayer. Really loved your insight here. I love the story of the Women at the Well. All day I have been pondering the statement Jesus made to her "I am He" I often wonder what it would be like to have Jesus sitting right next to you having a one on one conversation. What would Jesus say to me? What would He ask me? Great questions and insights. I love the depth of Scripture and that each time we read the same passage, new thoughts jump out at us. Thanks for sharing these. There are lots of reasons I love this passage, and I like your take on it. One of the things is how very many depths of meaning there are in it; from the fact that talking to Jesus she sees herself as she is, (like we do in Adoration)to the drawing of water (the gifts of the Holy Spirit) to accepting Him as the Messiah as our Saviour. (Would we know Him if we saw Him?) And so on!